As mentioned earlier, the NX10 offers excellent handling, and it’s very easy to get the hang of the controls and the simple to understand menu system. Focusing is quick but because the NX10 uses contrast-detect autofocus like most compacts, many entry level DSLRs will be slightly quicker to lock onto subjects. I found the NX10’s focusing system sometimes got a little confused with scenes containing fast motion, even in continuous auto focus mode, which led to occasional out of focus photos. Novices who tried the review NX10 found it simple enough in the auto modes and the pop-up flash proved to be powerful and effective at lighting darker scenes when left to its own devices. Manual shooting modes are easy to drive using the nicely placed control wheel, with the rear screen and EVF showing clear and user-friendly pictorial indications of settings such as ISO, AF Mode or White Balance. Images from the NX10 were excellent at lower ISO settings. Detail levels are high, even at high magnification as predicted from a high megapixel sensor, but noise starts to become a factor at ISO800. Shots taken at ISO1600 display considerable noise and detail softening, but the NX10 isn’t really any worse than equivalently priced cameras in this regard. Metering and exposure were uncannily accurate in a variety of conditions and the White Balance was usually dead-on when set to auto. The NX10 can capture RAW files, but its processing of RAW files is slow, with a delay of around four seconds before playback can be initiated. Fortunately settings such as ISO or White Balance can be altered while the camera is processing. The speed of continuous shooting is also adversely affected, and the buffer rapidly fills before shooting slows to a crawl. Continuous shooting of JPGs proceeds far more smoothly though. Deleting of individual files on camera is also slow, so it seems Samsung could have specified a faster processing engine to keep up with demanding users. Then again, entry level DSLRs in the NX10’s price range aren’t exactly speed freaks either, so perhaps apples need to be compared with apples here. Battery life was superb, with the NX10 needing only a single charge over the entire test, which included a fair amount of flash use and a lot of time spent staring at the screen, which must be very efficient in terms of its power consumption. Video quality at 720P was excellent, with sharp, well saturated footage. Sound was clearly captured by the internal microphone, particularly with the 30mm fixed lens, where there’s no temptation to zoom and cause distracting camera noise. There is a short delay after the shutter button is pressed before recording actually starts, and users will need to be aware of this if they’re not to lose the first second or so of their clips. When a company as large as Samsung decides that it’s going to make inroads into a market, it should be taken seriously. 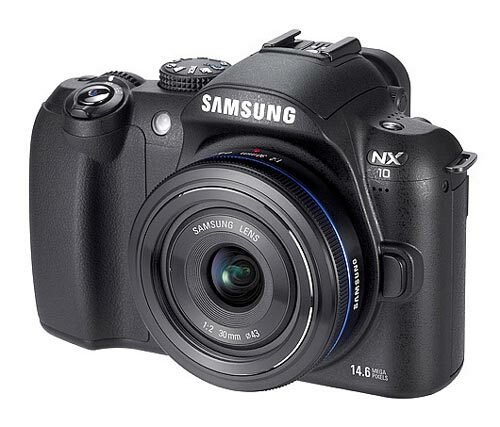 The NX10 is Samsung’s first serious shot at the advanced photography market (the previous rebranded Pentax DSLRs don’t count) and it’s quite a camera. The NX10 doesn’t stand head and shoulders above competing hybrid cameras from Panasonic and Olympus, but it doesn’t fall behind them in any meaningful way either. That’s quite an achievement in its own right.